یکی از متغیرهای مهم در بررسی اثرات ساختگاهی، تعیین بسامد طبیعی نوسان خاک است. در مطالعه حاضر برای تعیین این متغیراز اندازه‌گیری‌های مایکروترمور به عنوان روشی سریع، ساده و ارزان استفاده شده است. بدین منظور در 74 نقطه از شهر شیراز اندازه‌گیری‌های مایکروترمور به روش تک‌ایستگاهی با طول زمان 5 تا 10 دقیقه انجام پذیرفت. در ادامه برای تعیین بسامد طبیعی نوسان خاک از روش نسبت طیفی مؤلفه افقی به قائم (H/V) و یا همان روش ناکامورا استفاده شد. برای به ‌دست آوردن طیف‌های مورد نظر نیز از روش طیف فوریه و طیف توان استفاده شد. نتایج بیانگر آن است که مقادیر بسامد طبیعی خاک در نقاط مختلف شهر دارای مقادیری در بازه 5/0 تا 6 هرتز است؛ به‌طوری که در مناطق خاوری و شمال شهر که رسوبات آبرفتی با ستبرای بسیار کم دارند، این مقدار بسامد افزایش یافته است. همچنین با توجه به نتایج مطالعات، ضریب بزرگنمایی آبرفت دارای مقادیری در بازه 3/1 تا 5 است. همچنین به منظور بررسی وابستگی زمانی دوره تشدید، پس از گذشت 8 سال از برداشت داده‌های اولیه، در 5 ایستگاه دوباره برداشت داده صورت گرفت. نتایج حاصل از این برداشت‌ها بیانگر تطابق قابل قبول نسبت‌های طیفی حاصل از برداشت داده‌ها در دو بازه زمانی مختلف و برای 5 ایستگاه مورد بررسی بوده است. Natural frequency of soil is an important factor in site effect studies. In order to determine this parameter, microtremor measurements were applied as a fast, simple and economic tool. For this purpose, microtremors were recorded in 74 points with time durations of 5 to 10 minutes throughout the city of Shiraz. Natural frequency and amplification factor of soil were then estimated considering the main peak in spectral ratio between horizontal and vertical components (H/V) that is also known as Nakamura’s technique. Fourier and power spectrums were also used to determine this spectral ratio. The results demonstrate that natural frequency varies from 0.5HZ to 6HZ in different parts of the city, so that it increases in the east and north part of the city where alluvial deposits over the bedrock are thin. Also, amplification factor of the alluvial deposits obtained by this method has values between 1.3 and 5 throughout the city. In order to investigate time-dependence of the natural frequency, after 8 years of data recording new data were recorded in five stations. The results indicate acceptable correlation and consistency between old and new data results in these five stations. اسدی فلاح، ج.، 1387- بررسی اثر ساختگاه بر جنبش نیرومند زمین در گستره شهر شیراز، مؤسسه ژئوفیزیک دانشگاه تهران. داوودی، م.، حق­شناس، ا. 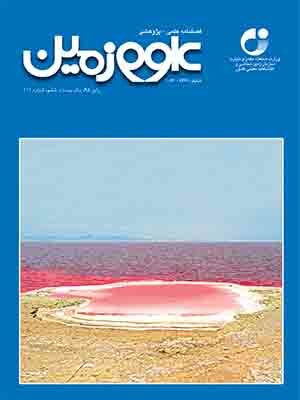 و میرجلیلی، م.، 1387- کاربرد روش آرایه­ای خردلرزه­ها در تعیین پروفیل سرعت موج برشی لایه‌های تحت­الارضی در یک سایت نمونه در شهر تهران- مجله علمی پژوهشی زمین لرزه‌شناسی و مهندسی زمین لرزه، سال دهم، ویژه­نامه فارسی، صص. 205 تا 215. مهرآیین، ل. و تاتار، م.، 1385- مطالعه اثر ساختگاه در جنوب باختری تهران با استفاده از اندازه­گیری میکروترمور- مجله علوم زمین، سال پانزدهم، شماره 59، صص. 24 تا 38. Aki, K., 1957- Space and time spectra of stationary stochastic waves with special reference to microtremors, Bulletin of the Earthquake Research Institute, University of Tokyo, No.35, 415-457. Asten, M. W., 1978- Geological control on the three-component spectra of Rayleigh wave microseisms, Bulletin of Seismological Society of America, Vol. 68, No.6, 1623-1635. Brocherdt, T. D., 1970- Effects of local geology on ground motion near Sanfrancisco Bay, Bulletin of Seismological Society of America,Vol. 60, 29-61. Field, E. H., Jacob, K. H. and Hough, S. E., 1992- Earthquake site response estimation: a week motion case study, Bulletin of Seismological Society of America, Vol. 82, No. 6, 2283-2307. Field, E. H. and Jacob, K., 1993- The theoretical response of sediment layers to ambient seismic noise, Geophysical Research Letter, No. 20, 2925-2928. Ghayamghamian, M. R. and Kawakami, H., 1997- Segmental cross-spectrum in microtremor spectral ratio analysis, 7th International Conference on Structural Safety and Reliability, Kyoto, November 24-28, 1487-1494. Gutenberg, B., 1958- Microseisms, in Advances in Geophysics, Academic, New York, No. 5, 53-921958. Lermo, J., Rodriguez, M. and Singh, S. K., 1988- The Mexico earthquake of september 19, 1985-Natural period of sites in the valley of Mexico from microtremor measurements and strong motions data, Earthquake Spectra, Vol. 4, No. 4, 805-814. Nakamura, Y., 1989- A method for dynamic characteristics estimation of subsurface using microteremore on the ground surface, Quarterly Report Railway Technical Research Institute, Vol. 30(1), 25-33. Nakamura, Y., 2000- Clear identification of fundamental idea of Nakamura's technique and its applications, Proceedings of the 12th World Conference on Earthquake Engineering. Auckland, New Zealand. Nogoshi, M. and Igarashi, T., 1971- On the amplitude characteristics of microteremore (part 2), Journal of Seismological Society of Japan, No. 24, 26-40. Okada, H., 2003- The microtremor survey method (translated by Koya Suto), Geophysical Monograph Series, Society of Exploration Geophysicists No. 12, p.135. Safak, E., 1991- Problems with using spectral ratios to estimate site amplification, Proceedings of the 4st International Conference on Seismic Zonation, Stanford, California, 277-284. Steidl, J. H., 1993- Variation of site response at the UCSB dense array of portable accelerometers, Earthquake Spectra, Vol. 9, No. 2, 289-302.